:This book presents two topics. First, HOMILETIC I, is for teachers and students in Biblical Institutes through local studies and correspondence courses. Second, CHOSEN OUTLINES presents a collection of carefully selected sermon outlines from the heart of people who have devoted themselves to the work behind the pulpit. With the help of the Holy Spirit, the reader will find a variety of abundant material for the preparation of their messages and other subjects that can be presented and studied in the church. It's our hope that this volume will help inspire and give direction to the person who is willing to utilize the context of this book and also to those who will listen to the glorious message of the Lord. 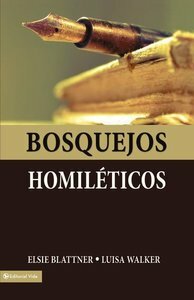 About "Bosquejos Homilticos (Sketches Homiletic)"